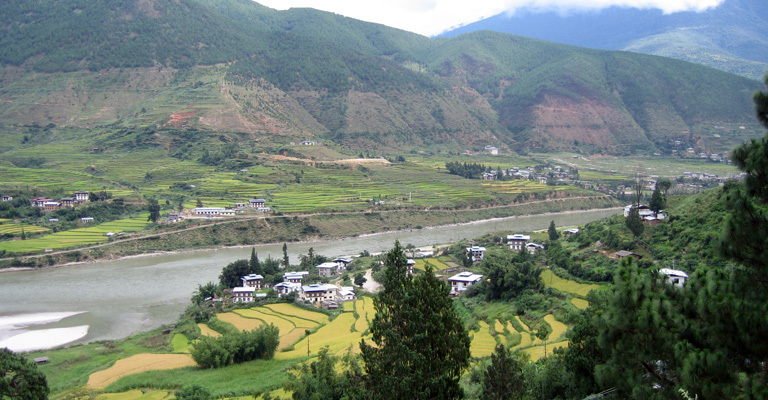 Central Bhutan Tour through the mystical Western valleys of Bhutan is an ideal introduction to the Dragon Kingdom. Experience Bhutanese hospitality, admire the ever-changing landscapes, and immerse yourself in Bhutan’s rich Buddhist culture. Highlights include Ta Dzong Museum, Rimpong Dzong with its wooden cantilevered bridge and the infamous Taktsang Monastery (Tiger’s Nest) in the beautiful Paro Valley, The National Memorial Chorten, 12th century Changangkha Temple and the National Library exhibiting ancient scriptures in Bhutan’s capital Thimphu, and after crossing the 3050m Dochula Pass with spectacular Himalayan views, a journey into the sub-tropical Punakha Valley featuring the incredible the Punakha Dzong and Chimi Lhakang, temple of the ‘Divine Madman’. In the evening you can drive to the capital town of Thimphu. After sightseeing in Thimpu you will drive to Punakha, with a stop en route for tea at Dochu La (3,100 meters), where on a clear day you can get spectacular views of the Himalayas. After lunch at Wangduephodrong continue to drive to Punakha, the former capital of Bhutan. After breakfast visit Punakha Dzhong, which is noteworthy both for being one of the most beautiful dzongs in Bhutan and also for having been built by the first Shabdrung in 1636. After visit Punakha drive to Gangety (Phobjikha) Is one of the few facial valleys in Bhutan and chosen home for Black Neck Cranes Which migrate from the central Asiatic Plateau to escape its harsh winters. Explore Phobjikha valley and also visit to Gangtey Monastery the only Nyingmapa monastery in Bhutan. Evening you will return to Wangdiphodrang for overnight stay. Today we drive along the winding mountain road to Paro. Afternoon, visit Bhutan's national museum, a fascinating place housed in an old watchtower above the huge Paro Dzong (monastery/fortress). The museum holds a fantastic collection of Bhutanese national treasures ranging from ancient armour to textiles and thangkha paintings. Then, we drive to the head of the valley and visit Drukgyel Dzong built in a location that was chosen for its control over the route to Tibet. A spectacular view of Mount Jumolhari (23,996ft /7314m) can be seen from here. Also visit Rinpung Dzong and a typical Bhutanese farm house. After breakfast hike to Taktsang (Tiger’s Nest) Monastery, Bhutan’s most famous monastery. It is perched on the edge of a steep cliff, about 900 meters above Paro Valley. The hike to reach the viewpoint to the monastery makes for a nice half-day excursion. After lunch you can visit other important site which you could not complete previous days. Drive to the airport to connect flight for onward destination. Or Fly to Kathmandu for Nepal Tours. My sister and I traveled in Nepal, Tibet and Bhutan for 2 weeks with Friendship Tours. The trip, including all the internal airflights, visas and accommodations was arranged by Roka, the manager of Friendship Tours. He certainly did his very best to make this an enjoyable adventure. Our hotel in Kathmandu, Yak and Yeti was first rate with a great outdoor swimming pool, health spa and beautiful gardens. The Potala Palace tour was the highlight of our 3 days in Tibet. However, the accommodations at the Manasarovar Hotel in Lhasa left a lot to be desired. We thoroughly enjoyed our stay in the kingdom of Bhutan, our guide and driver were exceptionally friendly and informative about their country's culture. The last stop on our adjenda was the Royal Chitwan National Park. Although the accommodations at the Machan Paradise View were rather spartan, we enjoyed the elephant safari ride, looking for rhinos and other big game. Roka and his staff of guides and drivers made this an exciting and enjoyable trip to be remembered.